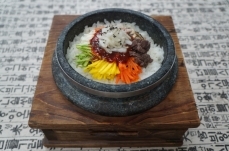 Recipe | 비빔밥세계화사업단 영문 홈페이지에 오신것을 환영합니다. 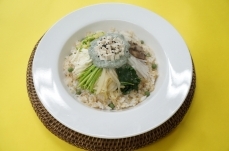 It is known that the term bibimbap was first mentioned in the literature, Siuijeonseo. It is told that, when Sim Hwan Jin was newly appointed as the governor of Sangju in 1919, he borrowed a cooking book kept in a noble's house in Sangju and transcribed it on ruled paper which he then passed down to his daughter-in-law, Hong Jeong. The period when Sim Hwan Jin transcribed the book was around 1919, but it is estimated that the original book dated back to the end of the 1800s. This book has relatively well categorized and organized a wide scope of cooking recipes and offers a quick glance of foods that were available at the end of the Joseon Dynasty. Cook the rice to have fair and clear rice, roast the marinated meat and the sauteed meat (sauteed meat used in ancestral rites; it is made with cow liver or manyplies or fish meat) is fried and cut. Fried vegetables of varied colors are added and choice kelp are fried to make fried kelp which are crushed into pieces to be added to the bibimbap. Mix all ingredients into the rice and add a lot of ground sesame mixed with salt and oil to be mixed with the rice in a bowl. 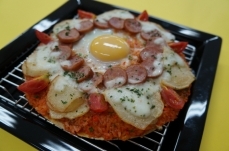 Fry eggs and cut into pieces like domino pieces and place on top of the rice like an assorted dish. Meatballs fried in egg batter are made by finely mincing the meat and well marinated, then formed into small marble shapes which are slightly coated with flour and eggs and then fried. 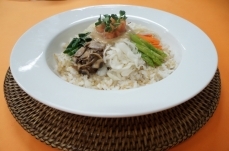 The clear soup accompanying the bibimbap is made as a hodgepodge soup. Remove the solidified oil that remains after boiling an ox-head for a long period of time. Add rice to broth to make the perfect steam rice and when the rice is done, add bean sprouts and let the rice settle. After, when the rice is still warm, season it with sesame oil. Green bean sprouts and water parsley are each parboiled and seasoned with sesame oil and thin soy sauce. The balloon flower is salted down and massaged and rinsed and pressed to remove moisture and then sauteed. The bracken is boiled and seasoned with oil sauce and then sauteed. 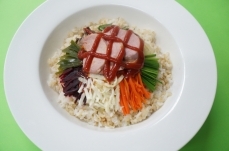 The rump meat is shredded into the form of Korean style raw beef and seasoned with marinade sauce. The green lentil jelly is made in large pieces and the eggs are separated into white and yellow layers to be fried and then cut. 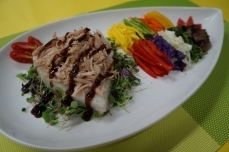 Put the rice into the brass bowl with a lid and place the ingredients of various colors by color on top of the rice. 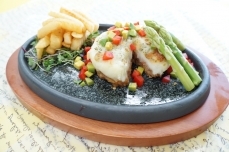 The red pepper paste is separately served in a small dish. 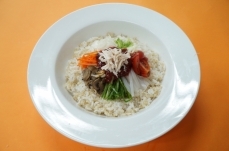 The Jeonju bibimbap must be accompanied by a bean sprout soup. 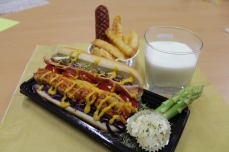 주재료◎ Main ingredients (1 serving) - 50 g rice, 20 g carrot, 20 g cucumber, 30 g button mushroom, 20 g sweet pepper, 20 g bell pepper, 20 g red cabbage, 10 g sprouts, 30 g egg, 150 g chicken breast ◎ Supplementary ingredients (sauce) - 30 g ter..
주재료◎ Main ingredients (1 serving) - 50 g rice, 20 g carrot, 20 g cucumber, 30 g button mushroom, 20 g onion, 20 g sweet pepper, 20 g bell pepper, 20 g beet, 20 g bean sprout, 20 g cauliflower, 150 g beef tenderloin ◎ Supplementary ingredients (..
주재료◎ Main ingredients (1 serving) - 1 hamburger bun, 150 g bibimbap patty, 1 egg, 20 g cucumber, 20 g onion, 15 g cabbage, 20 g tomato, 20 g bell pepper, 1 sheet of sliced cheese, 1 sheet of sliced ham - Bibimbap patty 70 g rice, 25 g sautéed ho..
주재료◎ Main ingredients (1 serving) - 70 g rice, 20 g carrot, 20 g zucchini, 30 g button mushroom, 20 g sweet pepper, 20 g broccoli, 10 g corn, 10 g baby leaf, 30 g chicken breast, 1 sheet of tortilla ◎ Supplementary ingredients (sauce) -25 g pe..
주재료◎ Main ingredients (1 serving) - 70 g rice, 20 g carrot, 20 g bean sprout, 20 g cucumber, 30 g button mushroom, 20 g onion, 20 g sweet pepper, 20 g cauliflower, 25 g beef ◎ Supplementary ingredients (sauce) - 25 g pepper paste 20 g peppe..
주재료◎ Main ingredients (1 serving) - 80 g brown rice, 20 g white rice, 40 g carrot, 25 g cucumber, 50 g button mushroom, 20 g zucchini, 20 g egg white, 20 g konjac (devil’s tongue jelly), 20 g cabbage, 20 g tomato, 40 g chicken breast ◎ Supple..
주재료◎ Main ingredients (1 serving) - 50 g brown rice, 50 g white rice, 40 g carrot, 40 g spinach, 50 g button mushroom, 20 g onion, 20g egg white, 20 g beet, 20 g cabbage, 10 g asparagus, 40 g salmon ◎ Supplementary ingredients (sauce) - Nutt..
주재료◎ Main ingredients (1 serving) - 50 g brown rice, 50 g white rice, 40 g carrot, 40 g spinach, 50 g button mushroom, 20 g onion, 20 g kelp, 20 g egg white, 20 g beet, 20 g leek, 40 g duck breast ◎ Supplementary ingredients (sauce) - Tomato..
주재료◎ Main ingredients (1 serving) - 90 g brown rice, 10 g pea, 40 g spinach, 50 g button mushroom, 40 g zucchini, 20 g onion, 20 g egg white, 20 g yacon, 10 g cabbage, 10 g broccoli, 10 g tofu ◎ Supplementary ingredients (sauce) - Bean sauce ..
주재료◎ Main ingredients (1 serving) - 100 g rice, 40 g carrot, 25 g cucumber, 50 g mushroom (button mushroom), 40 g zucchini, 30 g egg, 40 g broccoli, 40 g beef ◎ Supplementary ingredients (sauce) - Sautéed hot pepper paste 19 g pepper paste,..